London state schools have undergone a "startling turnaround and are now the best in England" according to a study by the Financial Times newspaper. 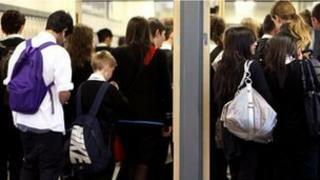 The FT analysed 3.5 million children's exam results for the six years to 2011. In 2011 London pupils did better in five GCSEs including maths and English than pupils from any other region. FT education correspondent Chris Cook said that when the figures were adjusted to account for poverty London's performance was even stronger. Analysis of the data from the National Pupil Database showed that results improved during the six-year period. In 2004 London's exam results were just fourth best out of nine English regions. During the period the performance gap between richer and poorer pupils narrowed in London - a change that was not mirrored elsewhere in England, suggests the analysis. The FT says that by 2011 pupils in some of the poorest areas of the capital were outperforming children in more affluent areas. For example the FT says: "A London child can expect to achieve one better grade in three subjects than a similar child from a similar neighbourhood in the south-eastern counties". At their most extreme the figures suggest a child from the top-performing borough, Westminster, would outperform a similar child from a similar neighbourhood in Hull by two grades in every subject. Commenting on the findings, Chris Husbands, director of London University's Institute of Education said the improvement in London results made the capital "not only the national but in many ways the international school success story in the last 10 years." Professor Husbands also praised the targeted interventions that had helped improve teaching and management in many London schools. The FT also quotes Lord Adonis, a former schools minister under Labour: "For 15 years London has been the pathfinder for school reform." Lord Adonis particularly praised the Teach First scheme which encourages top graduates into teaching and which began in the capital. He also said the academy programme and the London Challenge which ran for eight years until 2011 were effective in turning around poorly-performing schools. A DfE spokeswoman said: "London's schools have made great strides in recent years and should be congratulated on their improvement. "Great leadership, high-quality teaching, the success of academies and strong partnerships, where strong schools support weaker ones, have driven this progress in London. We would like all schools across England to match this success, raising standards for all our children."